How to help users gaining high-level view on their actions? During actions, users are generally focussed on interactions allowing them to reach their goals while high-level knowledge could require more distance with actions. Introduce high-level indicators which must be understood and observed by the user to complete objectives. For example in Starbank, a SimCity-like Serious Game to make understand how works a bank, a pedagogical objective is about understanding the departements and services. So when the user builds a new structure, advanced indicators and graphs show the consequences on benefits and help to determine the best moment to build (see pictures). 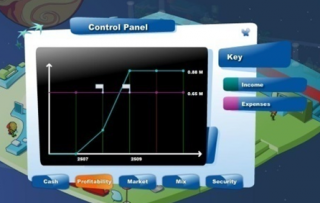 The user can unlikely progress into the game without learning to use these strategic indicators which offer high-level views on the activity of a bank.